Becoming Healthier with Sherrie: My Mom Calls Me "The Bag Lady"
My Mom Calls Me "The Bag Lady"
When it comes to setting goals, we’ve all heard various quotes about the importance of planning and being prepared, and below are some of my favorites. I can honestly say in my own personal health and fitness journey I’ve learned that’s been the key to my success. I wasn’t always this disciplined in preparing for my week, or even each day. But, because I don’t just blow off all this knowledge the trainers have passed on to me, I continue to listen to them put it into practice and work on changing my habits. I wasn’t always in the habit of planning my weekly meals, let alone prepping them for the week. I didn’t always plan my additional cardio or runs for the entire week around my scheduled sessions. But over the past five plus years, that’s exactly what I’ve been able to do. For the past couple years I’ve been very disciplined about planning and preparing for my week. That includes my meals and workouts, and then each night preparing for next day based off my weekly plan, which leads to what you see in the picture. As you can see there are five items, and those items include two workout bags, backpack, lunch bag, and my purse. This is what I do each night. I get everything ready for the next day. 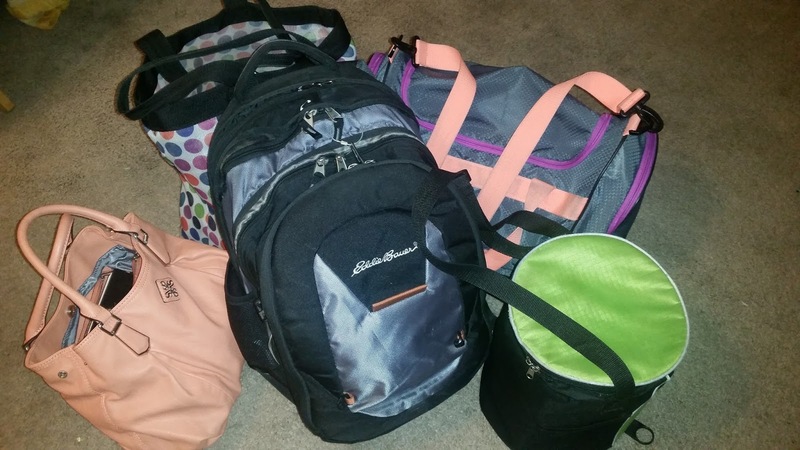 In the duffle bag I pack my workout clothes, two to three changes depending on what I’m doing the next day. The mesh polka dotted bag has my essentials to get ready at the gym after my workouts, and it also serves as the bag I put my sweaty workout clothes in when I’m done. I do this because I typically start my day around 5:00 AM and don’t get home until after 6:00 PM and I don’t want sweaty clothes enclosed in a bag all day with my other clean workout clothes or in a bag that’s not able to “breathe”. Then my backpack has anything I might need throughout the day, my Bible, daily devotional, my writing journal, whatever book I’m reading, my food/workout journal, and my laptop. And the last thing of course is my purse. Where else am I going to put all that money? Ha! During the week this is what I typically walk out of the house with just to turn around and lug it all back in that same night so I can do it again the next day. And on Wednesdays I have another bag with my boxing gear that I also have to take with me. Multiple times I’ve tried condensing or figuring out a way to lug around less baggage, but to be honest, I need everything in these bags daily. I talk about the importance of being healthy, not just physically, but mentally, emotionally, and spiritually. Everything I need to be prepared each day to become a healthier me is right there in all those bags. Physically, I’m prepared by having my workout bag packed for my workouts, having my lunch packed for what’s on my meal plan, and having my food/workout journal nearby keeps me on track. Mentally/Emotionally (these always seem to connect), I’m prepared by having my book of choice I’m reading, my writing journal, and laptop so when I start feeling stressed or the anxiety start to kick in, I have what I need to get through it. I’m able to create space and read or work on my blog at lunch, or just taking time to meditate and journal. Spiritually, I’m prepared by having my Bible and daily devotional so when I need just more than self-meditation and journaling, I can read scripture or my daily devotionals. So, yes, I walk out of the house each morning as "The Bag Lady", but when it comes down to it this is why I’m able to be successful each day. I’m not perfect, I have bad days and even weeks, but because I take the time to prepare as much as possible I get through those days and weeks a lot better than I used to in the past. Being prepared has helped me meet many goals, be successful, and allows me to continue to grow as a person and continue to better myself. What do you do to make sure you’re preparing for success?